The 55th New York Film Festival has come to a close. Here are a few of my favorites and other highlights from this year. Bruce Weber’s Robert Mitchum documentary “Nice Girls Don’t Stay For Breakfast” may still be a work in progress, but fans of the iconic actor won't be disappointed by the version shown at the festival’s Mitchum retrospective. Shot in the black and white cinematography befitting a veteran of noir (“Out of the Past”) and nightmares (“The Night of the Hunter”), “Nice Girls Don't Stay for Breakfast” lets viewers take a long, deep puff of pure, unfiltered Robert Mitchum. Bespectacled, grey-haired and never without a cigarette and a flirty comment, the legend cuts a bemused, relaxed figure, masterfully posing for the camera. When not describing his numerous adventures or explaining his standard answer when someone asks how he’s doing, Mitchum is shown singing several standards in a recording studio. The songs remind us that he once cut a calypso album between acting gigs. Clips from some of Mitchum’s more famous movies occasionally pop up, as do interviews with family members and actors like Polly Bergen, who recounts a familiar tale about her first, menacing day on "Cape Fear." We also learn how Weber was able to convince the press-shy actor into agreeing to be photographed and filmed for posterity. Robert Mitchum died in 1997, so Weber’s footage is over 20 years old. With 2017 being Mitchum’s centennial, “Nice Girls Don’t Stay For Breakfast” is a nice celebration. I can’t wait to see what the finished product looks like. I thought the festival’s picks for the Opening Night, Centerpiece and Closing Night were better last year. "13th," “20th Century Women” and “The Lost City of Z” were all excellent films. I was not a fan of this year’s Centerpiece, the overwrought “Wonderstruck,” and despite gorgeous cinematography by Vittorio Storaro the Closing Night selection “Wonder Wheel” (pictured above) is one of the worst movies of 2017. Kate Winslet gets the "Joseph Gordon-Levitt in 'Don Jon'" award for the worst Noo Yawk accent. But even if she had sounded as pitch-perfect Brooklyn as Cousin Brucie, nothing could have saved her from Woody Allen’s horrendous screenplay. I’m in the minority on this one, and I’m happy to be there. I also seem to be in the minority on this year’s Opening Night film, “Last Flag Flying,” which is Richard Linklater’s semi-sequel to 1973’s “The Last Detail.” I went into “Last Flag Flying” with much hesitation, as Hal Ashby’s military masterpiece contained my favorite Jack Nicholson performance and an endless amount of well-placed bitterness. I expected much more sentimentality here, which I got, but I didn’t expect to be as moved as I was. Laurence Fishburne and Steve Carell are very good, but the film belongs to Bryan Cranston. He doesn’t imitate Nicholson, but he does capture the “I don’t give a f—k” nature of the character. Like “The Last Detail,” this is a film about the fictions that we’re told by the government and whether we choose to honor or mock the patriotic pomp and circumstance that come with them. While a bit more anger would have been welcome, “Last Flag Flying” still emerged as my third favorite film of the festival. At number two on my favorites was Greta Gerwig’s directorial debut, “Lady Bird,” the story of a high schooler played superbly by Saoirse Ronan. Gerwig’s script is a perfectly calibrated tale of a teenager trying to break out of a mundane Sacramento existence to spread her wings and fly to New York City. Ronan’s parents are played memorably by playwright Tracy Letts, who is spectacular and Laurie Metcalf, who is even better. The tension between Metcalf and Ronan rang true and was equally painful and hilarious. Their opening scene together builds to a shocking, uproarious crescendo that lets us know we shouldn’t expect a completely predictable journey. My favorite performance of Ronan’s remains her Oscar-nominated work in “Brooklyn,” but the monologue that ends “Lady Bird” may be her finest moment onscreen thus far. Dee Rees’ “Mudbound” is my pick for the best film I saw at the New York Film Festival. 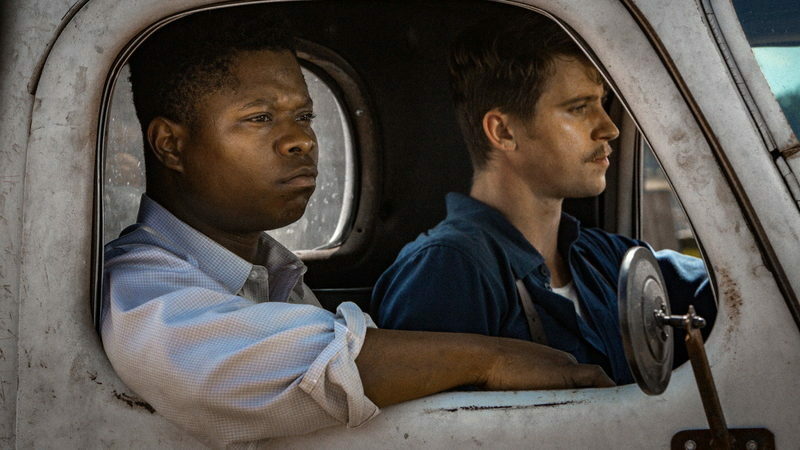 Featuring excellent performances across the board, especially by an Errol Flynn-like Garret Hedlund and a subtle, maternal turn by actor-turned-singer Mary J. Blige, this period piece about race, class and love could not be more timely. I’ll have more to say on this one when it’s released in November. Also timely is Robin Campillo’s “BPM (Beats Per Minute)," a chronicle of the French chapter of AIDS activist organization ACT-UP. Gently co-existing with scenes of ACT-UP meetings and protests is a love story between two members, Sean (Nahuel Pérez Biscayart), who is HIV-positive and Nathan (Arnaud Valois) who is not. As the pharmaceutical companies withhold information and potentially useful medications, Sean slowly becomes sicker and his fellow activists become angrier. As he watches the man he loves grow weaker, Nathan becomes the audience’s emotional stand-in. We feel his love intensely, and while Campillo’s camera is unsparing, “BPM" never devolves into movie-of-the-week representations of tragedy. There are moments of great joy and unflinching sexiness here, both of which are refreshing and welcome. The film’s last 30 minutes are basically a wake, but like all wakes, it’s filled with a group of people coming together to celebrate as well as mourn. I love movies about process—that is, films that show in great detail how something gets done. So your mileage may vary with "BPM"; there are numerous, long scenes of ACT-UP meetings that I found as compelling as the love story. If nothing else, however, "BPM" reminds us that effective protests aren’t neat, quiet affairs that occur when the privileged damn well want them to happen. Change is angry, messy, slow and not for the faint-hearted nor easily offended. It’s a message well worth considering nowadays, and this film does a good job conveying it. To read the rest of our coverage of this year's New York Film Festival, click here.